BlackRadioIsBack.com Video: D.L. Hughley | BlackRadioIsBack.com - Official Blog of the Syndicated FuseBox Radio Broadcast! This weekend, cable news channel CNN is going to give comedian D.L. Hughley (The Original Kings of Comedy) a shot doing his own weekend news & political comedy series with D.L. Hughley Breaks the News that premieres tonight (October 25, 2008) at 10 pm EST. With the success of such shows like Comedy Central's The Daily Show and The Colbert Report along with HBO's Real Time with Bill Maher, I can see the news channel seeing it as pretty smart move to enter into this realm of entertainment. D.L. Hughley is a pretty smart brother (though I do not agree with him all of the time at all) from hearing his commentary on various radio shows like the Tom Joyner Morning Show and other outlets, so him being able to get information out there as well as being able to keep it light at the same time should probably not be an huge issue. D.L. 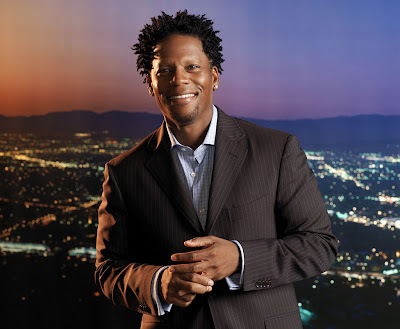 Hughley Talks About The Current Presidential Election on "D.L. Hughly Breaks The News"
This show needs to be cancelled. Sorry. I really think that the viewers need to make their opinions known at CNN! Let them receive thousands of complaints by phone and fax!! Blacks are sick and tired of seeing "buffoons" on television! We are tired of white networks putting black minstrels on the air when too few black intellectuals are being featured who will elevate the national dialogue! Let us make that known!